This home pictured above is on private property near the end of Robinson Neck Road on the right hand side after passing the Frank M. Ewing Robinson Neck Preserve Trail. The story begins with Solomon Kirwan who was born on Hoopers Island on June 19th, 1814, and Susan Kirwan who was born also on Hoopers Island on October 28th, 1814. They married and bought land on Taylors Island. These were the days of slavery and many slave houses were along the driveway to the home as evidenced by the many bricks from their fireplaces that I plowed up working the fields. 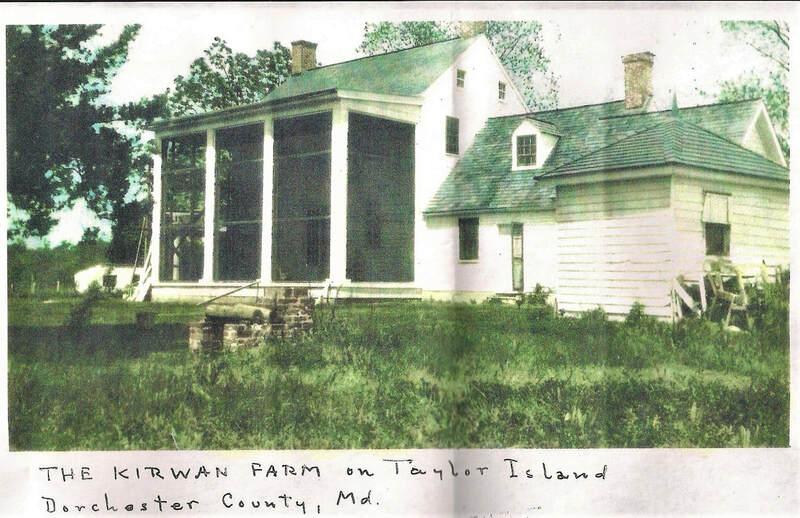 They built a home on Robinson Neck Road on Taylors Island in 1835. The builder was Marcellus Aaron, whose gravesite is on the Benbow property. According to the tombstone, Marcellus Aaron died July 3rd, 1879 in the 69th year of his life, which meant that he was born in 1810. According to the best records we know, the original farm totaled in excess of 750 acres or more. The land was cleared and worked by slaves. One can regret history but cannot change it. In 1970 my wife and I purchased the old Kirwan home from a Mr. James Harris, who had moved down from Frederick County a few years prior to our purchase, hoping to build a business here in Dorchester County. Not being a native and having no contacts, his hopes failed and he returned to Frederick County, selling the property to my wife and me. his son who said “Daddy, there is writing on the back of this”. There was a hard to see writing but very clearly signed by Marcellus Aaron, November 18, 1835. For 38 years I have zealously guarded this piece of antiquity. There were three or four dug wells on the property, scattered across the lawn and used until they needed replacement. However, at one time all the wells that were driven with pipes were artesian. There was a flow house near the kitchen where the water ran into a cement flow box and then drawn into the house via a pitcher-pump. The water would constantly flow into the flow box and then the overflow simply ran into the surrounding waterways. All the surrounding woods were leveled by slave labor and turned into farm land. For that reason there are very few old trees on any property. On the land we purchased in 1970 there were a few trees in isolated places that had to be 300 years old. Since 1970 most such trees have died and most present day trees are at most 50 years old. Usually land is timbered every forty to fifty years. Attached is a picture of the old house showing the original house, the kitchen, and showing the roof of the summer kitchen. The closer building (about 6’ by 6’) held the flow box, and later housed the electric water pump. The original Kirwan house was a two story main house with an attic where hams were hung. The drippings that stained the floor were old and crusted and spoke of many years of aging hams. The first floor of the home had two rooms, probably a living room and a dining room. Upstairs there were only two bedrooms and of course no indoor plumbing or water. Attached to the main house was a smaller kitchen that included an open fireplace that could take a six foot log. Above the kitchen was a bedroom that was probably used originally by the slave cook. There was no doorway or passage way from the cook’s bedroom into the main house. James Harris, in remodeling, had put in a small doorway to that bedroom that then gave the house three bedrooms. There was still a very narrow stairway that went from the kitchen below to the isolated bedroom above. This stairway was very steep and less than 2 feet wide. Attached to the older kitchen was a still smaller summer kitchen that could be used only in warmer weather because no heat source was available. Three old chimneys were in the house wit one in the kitchen and two in the main house, each of which opened into the two rooms on each floor. The screened two story front porch as not part of the original home but a later addition. We will return to that subsequently. On the picture, through the porch, can be seen another structure which could have housed a carriage. The roof of this structure was reached by a double door in the northern bedroom, which doorway is still there with nowhere to go. I was told that a previous owner, Maurice Halgren, an editorial writer for The Washington Post did much of his writing sitting on the overlook, inspired b y the nature around him. Around 1940 the house and all the chimneys were raised and a basement was placed under the house. This date is rather certain because shortly after we purchased the place in 1970 we found the whole porch to be termite infested. To remove the termite infested wood in the porch pillars and roof trusses I had to completely remove all the porch structure. Because of the old wood of the house, no termites had entered the house but had completely infested the pillars and the roof trusses. Therefore, the entire porch had to come down. What I found was that the pillars to the roof were placed in direct contact with the ground and the termites had easy and protected access to the relatively new wood in the roof. The old wood of the house was locust or hard oak that the termites could not attack, but the relished the new wood. The reason the date is certain is that I found newspapers that had been used for insulation and filling cracks, all of which dated in 1940. I am certain other such newspaper is still in areas I did not disturb. When they raised the house and dug the basement they placed in the house a water tank that was 4’ in diameter and 8’ long. This tank had to be installed through a massive opening because of its size. Around 1980the tank finally rusted out and to remove it from the basement I had a welder come and cut it into smaller pieces. Evidently after electricity came to the island the power would go off for a week or more but the full tank of water would hold it pressure and supply water if used sparingly. Probably after electricity came an entry hall with a bathroom above was added to the house. I still find cement walkways which probably went from the house to the outhouse. When we purchased the house the water table was 11’ below ground level. A shallow well pump was all that was needed. Over the years the table kept going lower and we had to go from a shallow well pump to a deep well pump. After the artesian flow stopped, they used driven wells with pipe around 1” that were driven around 300’deep. The pipes would rust out and after water was no longer available through the old system, people would have drilled 4” wells with submersible pumps. We did so about 1999 with the well being drilled 500’ to 600’. The water was always excellent-certainly in the days of artesian flow-and is extremely excellent today. After the porch was removed I decided to add two bedrooms on the second floor and use the first floor level as a dining/lounging area. The cement floor was very intact and a good base to build upon. My family decided that the second floor level should be one bedroom and not two, so what used to be the enclosed two story porch became one large bedroom on the second level and a dining/sitting room on the lower level. On the eastern side of the house stood two huge pecan trees, 70’ to 80’ tall. They were well over 150 years old and I like to think they may have been planted by the original owners. The northern most tree was damaged by a tornado around 2003, with part of the top being ripped off. In August of 2009 another tornado took the rest of the top off and huge branches are still laying there as I write this. Both trees were extremely lovely and spoke of life 100 years ago. Now the remaining tree is a solemn tribute to what used to be. The house is very empty today and I plan to totally rebuild it in the near future, preserving the old original style but bringing it back to its faded glory. Since the house was built in 1835 it is now almost 175 years old. Susan Kirwan died in 1882 and Solomon died in 1904, at 90 years of age. They are both buried, along with other family members, at the gravesite which was then part of the old farm, but now is on the land we purchased in 1998. It is our present plan and hope that both my wife and I will be buried in that same sacred gravesite. We love that land probably as much and maybe more than did the Kirwans, and if more, than only because they are buried there too. We are the grateful recipients of all their labor and love. I often pause at their graves and thank them for the heritage they have passed to us. May we be as noble as they, and may others reverence our efforts as we do theirs. Pictured is Rev. 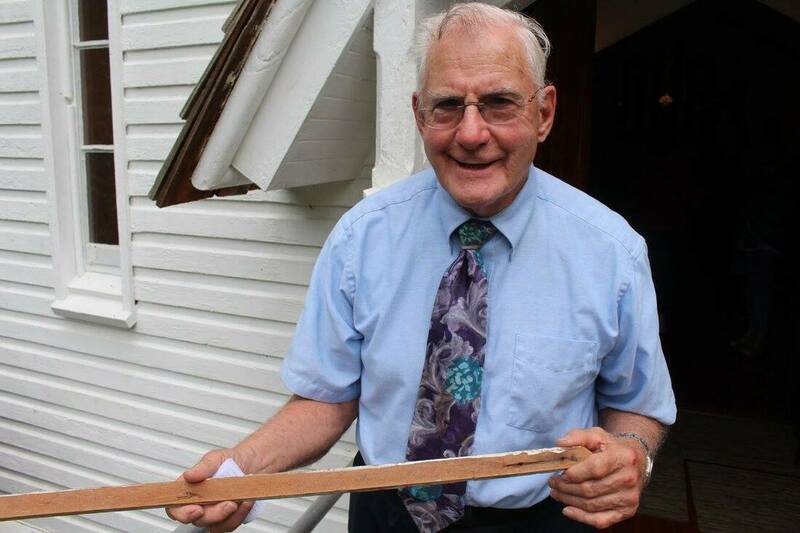 Robert Kirkley in 2016 with the quarter-round molding referenced in the story above.